Born into a musical background, Andrew developed a love of flamenco and classical guitar from the age of eight. At the age of sixteen, he auditioned into the Royal Marines Band, where he spent the next nine years performing in major concert halls worldwide, and at numerous state occasions, shows, and garden parties as a drummer. Upon leaving, he returned to his first love, classical guitar. Within one year of intensive study, he auditioned and was accepted onto performer degree courses at Leeds College of Music and Huddersfield University. It was during this time that Andrew entered the Harrogate Competitive Music Festival in the open Bach class. 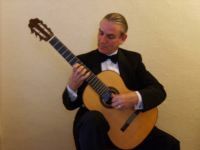 Adjudicator Prof. Graham Wade, a well known leading world authority on classical guitar, commended his playing and awarded him 1st Prize with Distinction. Around this time Andrew was also performing with the legendary Robin Nolan, leading British exponent of guitar on the International Gypsy Jazz Swing scene. Andrew continued master classes for a further two years under the internationally renowned teacher and recitalist Zoran Dukic in Amsterdam, Holland, where he honed his recital skills, taught privately, and played at weddings, corporate events and private parties. American record label CMH Records, and performed on the album Zorro And His Romantic Guitars, alongside top session percussionist Joe Lala (Diana Ross, Dionne Warwick, Herbie Hancock, Eric Clapton). teaching and performing throughout Austria,Switzerland,North Italy and the French Riviera. Throughout his extensive thirty year career as a musician, the desire and ability to be able to communicate through music to people of all ages and backgrounds, to continue to fulfil his potential. One could not be disappointed with both his vast musical experience, his ability to create the perfect ambience, and his easy-going, relaxed, but impeccably professional manner.